Revolution 360 - the type of field surface being installed at the new Mosaic Stadium - is designed and manufactured by FieldTurf. The company, based in USA, has installed turf in a number of NFL and NCAA football stadiums. According to the company's website, FieldTurf installed the same Revolution 360 playing surface at Princeton University this year. The new Mosaic Stadium will be the first in the Canadian Football League to feature the Revolution 360 playing surface. "We are proud to have been chosen to provide the playing surface at new Mosaic Stadium," said Eric Daliere, FieldTurf president in a press release. 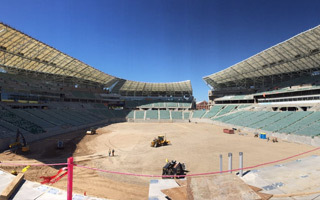 "We share a commitment to excellence and a deep appreciation of sport just as all the partners in the stadium project in Regina and we're excited to begin this phase of the project." The first test for the playing surface will take place October 1st, when the University of Regina Rams and the University of Saskatchewan Huskies take to the field. The new turf is expected to be fully installed in five weeks.